I have been working on my web site a lot, updating various aspects of the backend software and even implemented this blog. One thing I just recently upgraded was the flash photo gallery. 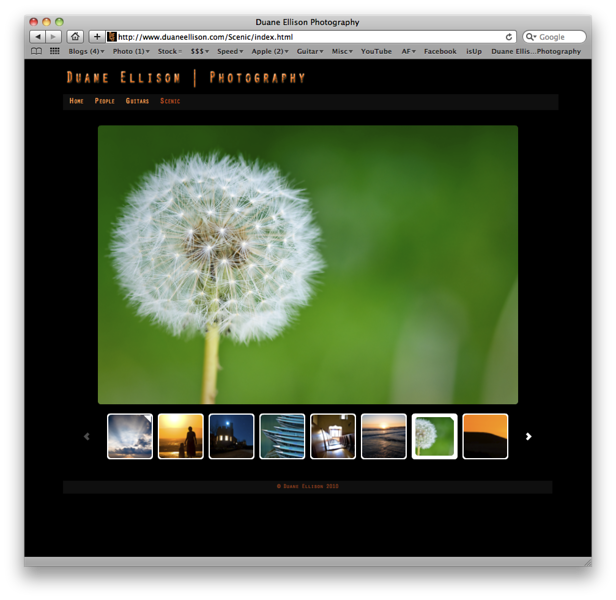 I was using Airtight Interactive's Simple Viewer as the prototype for the web site. I was looking for a good, fast and high quality viewer that provided the controls I was looking for and the look-and-feel that would fit well with my site. So in that vein I have been searching for various gallery options for weeks now and the one I kept coming back to was Simple View. So today I decided to bite the bullet I purchase the Pro version as my gallery of choice. It is fairly straight forward to setup and the included gallery builder application was wonderful for fine tuning the look and feel. If you are looking for a good flash gallery viewer then I would recommend you seriously consider Airtight Interactive's Simpler Viewer and their companion professional version!